Zorse, zonkey, zony, zebrass; these are all the things that happen when a zebra is put together with various kinds of horses. They come out looking every possible way. Some have zebra-like manes and striped legs. 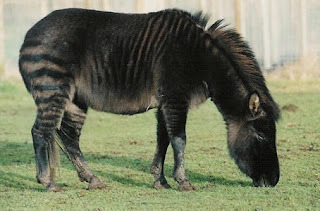 Some have pony bodies with faint stripes. Some are brown horses with white zebra stripes. Some are horses with black zebra stripes. Some look like someone threw a bucket of white paint at a zebra. It may be wrong to mess with nature, but it's an incredible image, sometimes.